Posted on August 7, 2011 June 20, 2013 by Emily S.
Well friends, this post is a bit delayed but better late than never I suppose. 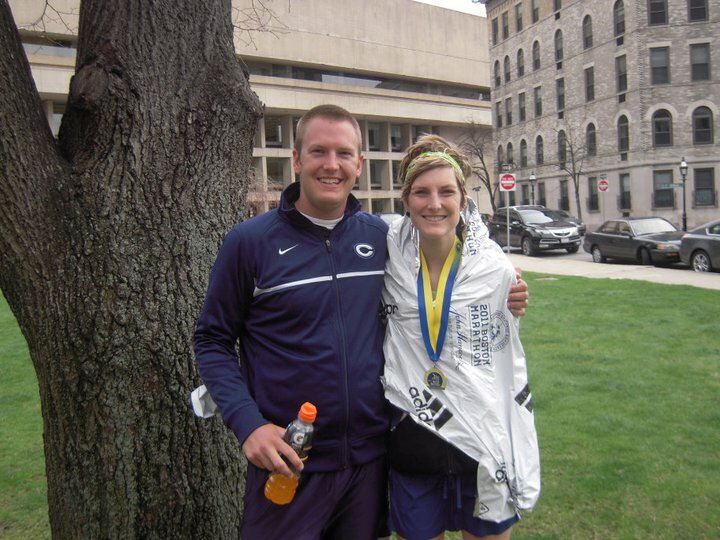 As most of you know, I ran the Boston Marathon oh let’s see – April 18 and I am finally taking the time and energy to write about it! I know the urge and readiness comes primarily because I’m in Boston again and it’s doing crazy things to me – bringing up all sorts of memories and feelings from that day. Boston was a huge thing for me and in my not so humble way I’m sure a lot of you knew about it (sorry about that, I’m working on it!). For the months leading up to it, running and training was my life. My weekends revolved around the planning it took to set aside hours to go for a run. The snow, ice, sleet, and snow plows nearly drove me to my limits but I had decided (and paid money, good ol’ Dutchie) that I was running this thing and so out I went. Through the dark of winter, the slippery roads and numb fingers and toes I ran. It did something to me. In some profound way I was able to get all the negative stress, fidgety movements and super harsh energy out of me. I always knew running was my release but never did it prove to be more true than this past winter. It brought freedom. I ran without a watch until about 1 month before the marathon knowing that time keeping became an obsessive behavior for me and therefore I couldn’t know how fast or slow I was. Finally April came – in fits and bouts of sleet and sun and I was ready. I had no idea what to expect, no idea what the course really was like except for this Youtube video I had watched. I tried to ask people who had done it before but received little that prepared me. In a crazy turn of events, I even switched my accommodations a week before the race. The day before I left Grand Rapids, my emotions were all over the place. 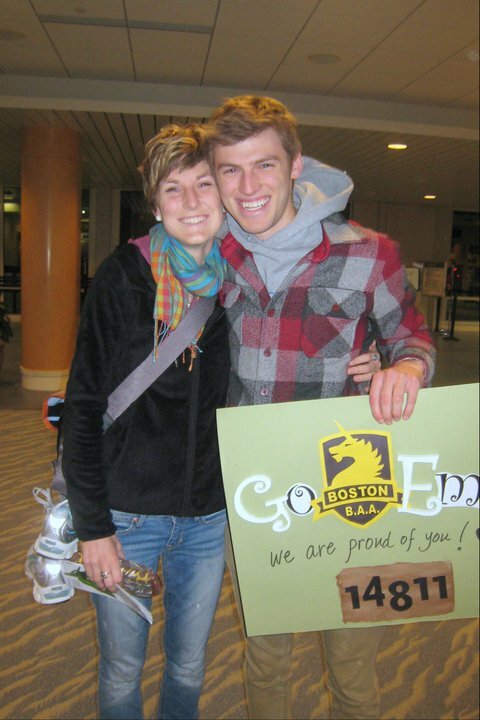 I was brought to tears when my dear friend Carrie dropped a gift off to my house that was JUST what I needed and I was surprised beyond belief when Chris & Misty showed up with posters at 5 am to the airport to send me off, their smiles travelling the many miles to come to my mind mid race. Chris told me he was so proud of me and I carried the tender words we exchanged with me all during the race. I boarded the plane and cried. A few hours later and much closer to Boston, I began to get excited. I looked around the plane and bet that 75% of the riders were either marathoners of friends of. There were running shoes hanging from people’s bags and athletic gear all over the place. As I walked off the plane, I was swept into a wave of excitement and Boston Marathon signs. The whole entire city was gearing up for this. My brother and sister flew all the way from California to see me – and I was blessed. I think they did it out of sheer love but my brother did bet with me on the first marathon. He told me if I qualified for Boston I had to go. I told him if I ran Boston he had to come. We both held up our bargains. Race morning dawned sunny and bright with just a bit of a chill. I walked to the park where all the buses in the whole city line up and was overcome with giddy excitement. 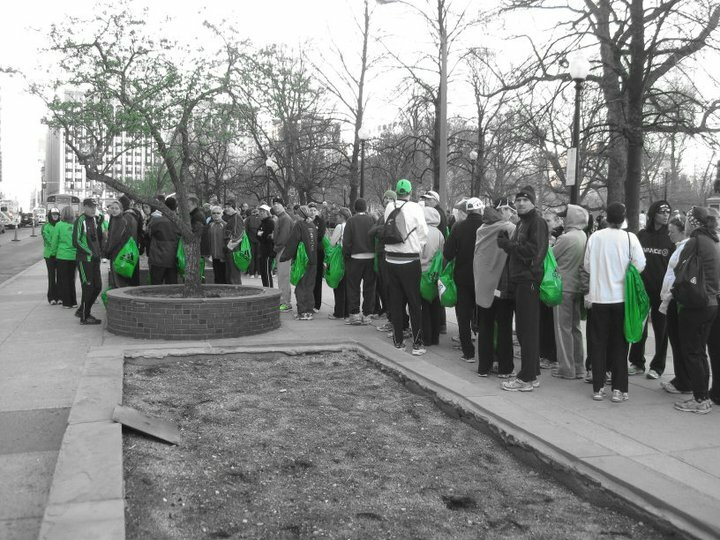 All the runners were chatting and telling stories and it was amazing, simply wonderful. After a bus ride, stinky porto-jons, a bagel and lots of Gatorade later my “wave” began to line up. Feeling a bit like cattle we organized ourselves by number and away we went – cheers, hope, and into the crazy unknown having no idea how we’d finish. I had shivers that first bit thinking of all the people who love me, who were cheering me on from home. I thought of my dad who was so darn proud of me and my mom who was just a bit worried. I thought of my friends all signed up for the text message updates. I thought of my coworkers seeing updates in the background of their workday. I shivered because I knew how insanely blessed I was. The first half was amazing. I hit my time goals for every mile and was feeling great. The spectators were amazing and I could tell a little bit about the character of each town we ran through. New sights and some crazy spectators along with prayers and number counting (yes I have many mathematical equations going through my head when I run). 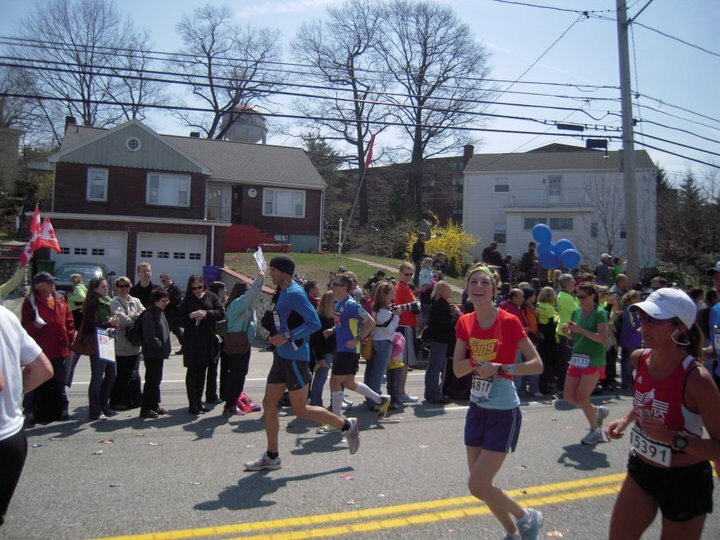 At about mile 16 I started scanning the crowd for Michael and Madison knowing they were somewhere there. It’s a bit dizzying trying to see every face but alas at nearly mile 17 there they were! Big smiles, Madison yelling and Michael getting ready to run. What an insane gift I had to be able to run 6 miles of this race with my brother. At first we both chatted casually but as the miles got hard, Michael did all the talking. Around mile 19 I was feeling downright slow. My legs aching, my tummy a bit on the fritz, the hills rising and Michael basically towing me along. A lady in front of me had a shirt that said “He restores my soul” and I chewed on that scripture for mental energy for nearly a mile. Little kids were handing out orange slices and Twizzlers which made me smile. We made it up Heartbreak Hill and I thought “Okay, only 5 miles to go”. At mile 21 I was hoping to kick it up a notch but had nothing left in me. I wasn’t really thinking clearly and my mathematical problems were a bit too much. Michael left the race at mile 23 and I felt like a piece of my soul had been ripped out. To finish this race all by myself seemed way too hard and my two word prayers for help continued. The last 3 miles were a blur of faces, pain, breathing, seeing Madison one more time!, and sheer dependence on God. I turned the final corner and the tears came. All of this sweat, pain, tears, and effort to cumulate with this! I didn’t reach my goal time and I knew that. Immediately the feelings of inadequacy came and the voices in my head analyzing where I could have sped up or what I could have done differently were banging. It took all I had learned over the past year to silence them. To accept that I had worked for and completed one of my goals and to put my expectations aside for a moment. Praise God for family and friends and their encouragement and congratulations. After I made it out of the med tent I gathered my belongings and saw the barrage of text messages – that’s when it hit me. Even if I wasn’t insanely proud of me, the ones I loved were. They had the strength and love and excitement and I could rest in that. Michael, Madison and I met up and went for food and my first beer in over a month. We celebrated the day, the miles, and the gift of one another. I’m still learning about expectations, about grace for myself and others. Boston was one more tick on this journey, one more test of patience and trust that God has this all, he is the race master and is gentle and kind. And he’s provided us with those we love to see us through. So, thank you. Thanks for the encouragement, patience, and excitement for me. It means the world to me and I hope and pray that I can be that for you someday.